The company was founded in 1980 by Edward J. Doughty, Jr. as Edward J. Doughty Plumbing and Heating. The company was incorporated in 2000 as Doughty and Sons, Inc. It is currently owned and operated by Edward J. Doughty III and James J. Doughty, 2nd generation master plumbers. 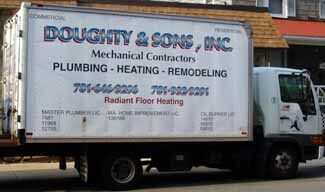 Doughty and Sons, Inc. specializes in leading edge technologies for heating, cooling and plumbing sytems. This allows us to keep your house comfortable and efficient throughout the year. We are available to to deliver comfort and value to all of your heating, cooling and plumbing needs. We service both residential and commercial customers.